A lifelong pumpkin fan and ghost enthusiast, Mark Milbrath is thrilled to finally be using his overly active imagination through words and stories. Mark has already had plenty of experience using his imagination through numbers; he’s worked for many years as a TV meteorologist and commercial real estate appraiser. He lives with his wife—and potentially knows the exact whereabouts of Maglich—in Northern Virginia. Other than writing, Mark enjoys playing the guitar, tennis, traveling, stargazing, birds, walking in the woods, frequenting pumpkin patches and the occasional late-October haunted activity. 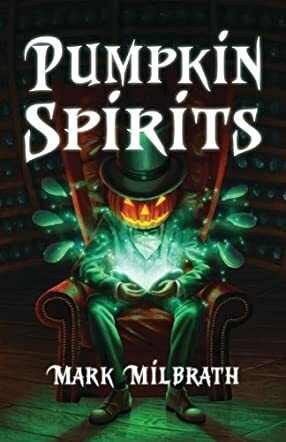 If you're looking for spooky stories and happy haunts, look no further than Mark Milbrath's Pumpkin Spirits! From the very beginning, Milbrath draws readers in with a chilling proposition: the Seed Reader will share one of his many tales with you and, in return, if anything frightening ever happens to you, you must share that story with the Seed Reader. All of the stories that follow are rich with details and descriptions, and the first person point of view makes readers feel as though they are sitting in the darkness of the Pumpkin Room with the Seed Reader, listening to one spooky story after another. The stories themselves are short reads, but they succinctly capture a range of emotions in a limited amount of time. One of my favorites in this collection is The Nightmirror, a story of two cousins, one of whom lives in a town where nobody celebrates Halloween. When Halloween rolls around, the two boys attempt to go trick-or-treating, but with no success, and instead encounter the mysterious Nightmirror Spirit, who uses mirrors as portals into the living world to steal kids and take them to the nightmare world. Other standout stories include The Ol’ Crone and Her Gnomes, The Pipin’ Mad Scarecrow, and The Visitor. With Halloween just around the corner, this book is perfect for readers who are looking for some thrills and chills in all shapes and sizes. Although this collection of stories is primarily aimed at children, parents and older siblings will also enjoy Pumpkin Spirits, and perhaps they’ll find that these thrilling tales will inspire them to share some stories of their own. A fun read that's sure to get you in the mood for Halloween!